Sweeping steppes make place for valleys and slopes covered in fir trees. Cones dot the ground. In the distance snow-capped peaks tower over the surroundings. I’ve never been to Mongolia, but I can dream of following part of the silk route. Winter can be tough out there in the wild. 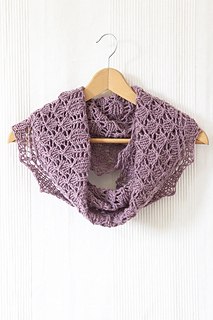 Wherever you are, in the midst of a cold winter, there’s no doubt you can use some warmth and wrap your neck in style. The Abies Trail cowl provides just that. 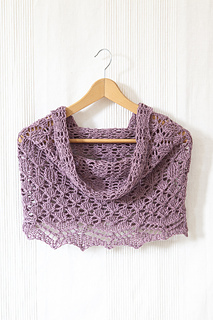 Worked in thick Aran yarn, the cowl knits up quickly with easy but fun alternating lace patterns. With this cowl, you can choose your adventure as two versions are provided. Whether you are up for a little challenge or instant-gratification, Abies Trail is for you, so join the adventure! 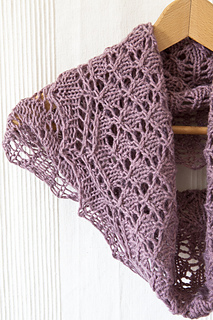 Fonty Mongolia 5 (Aran; 100% Merino; 90 meters / 98 yards per 50 grams); 3 balls; sample is shown in the Lace Master version and uses 112 grams in color Lilac 01. 6 mm (US size 10) 80 cm / 32 inches circular needle or size to obtain gauge. 17 stitches and 19 rows = 10 cm / 4 inches in Stockinette stitch, unblocked. 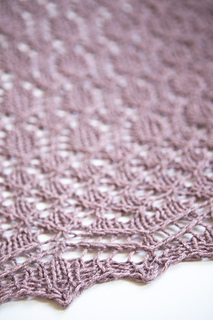 8 stitches and 22 rows = 10 cm / 4 inches in stitch pattern B, blocked. Removable stitch markers: 1 in color A (beginning-of-round marker), 13 in color B (optional). Tapestry needle. Blocking pins, (optional: blocking wires). Circumference (c) 98 cm / 38.5 inches, height (h) 44 cm / 17.25 inches. Basic stitches, increases, (double) decreases. Choice of regular CO and BO, or CO and elastic BO in pattern (video tutorials given). 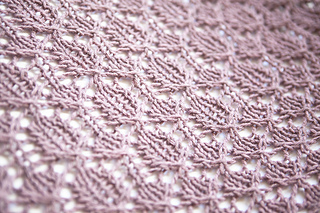 One stitch pattern with patterning on all round for the Lace Master version. 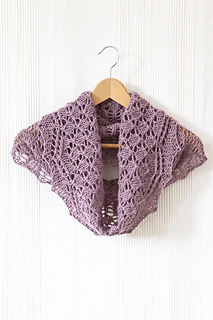 This pattern is worked in the round with a needle size larger than the yarn would call for. This produces a fabric with more drape. Swatch in pattern to check the drape. Two versions of the pattern are given to suit different skill levels (or provide a little challenge and opportunity to explore new techniques). Suggestions are given to customise the pattern. Charts and written instructions are provided as well as clear video tutorials for the used stitches. For questions about this pattern, please PM me on Ravelry or send me an email. Contact details are provided. I’d like to send a big thank you to my truly awesome test knitters on Ravelry: ceichy, linda5251, marsenault13, SimoneKnits. Thanks a lot for your time and dedication, for helping me make this pattern even better and for showing how the pattern would look like with different yarns!